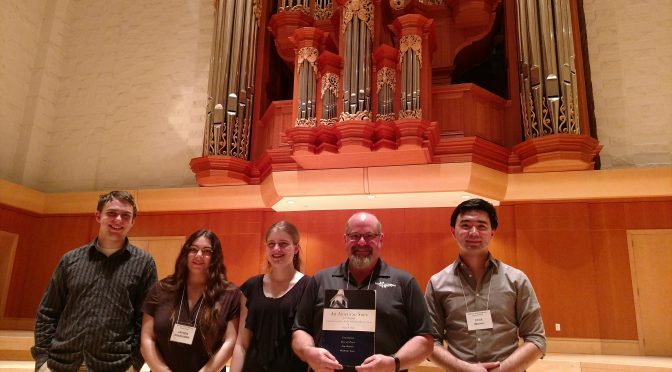 On May 22, the Tacoma AGO chapter gathered in Lagerquist Hall at Pacific Lutheran University for the final meeting of the season to hear students of Jonathan Wohlers in an end-of-the-year recital. Amy Castle, the 2016-2017 winner of the Tacoma AGO Scholarship, opened the program with the Prelude and Fugue in C Minor of J. S. Bach, BWV 549. Other students followed, with works of Brahms, David Dahl, Langlais, and Bach. The students included Charles Reinmuth (Music Education), Wendell Brunk (Nursing), Jayden Sparhawk (English), and Christopher Warren (Music). Dr. Wohlers is the Director of Music at Trinity Lutheran Church and has been serving as Acting University Organist at Pacific Lutheran University while Paul Tegels has been on sabbatical. 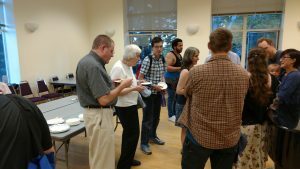 Many thanks to Karen Bredberg for coordinating the food for a reception following the recital! A PDF of the program is attached.